Why is Ronald Reagan so idolized by Republicans? Why Is Ronald Reagan So Idolized by the GOP? 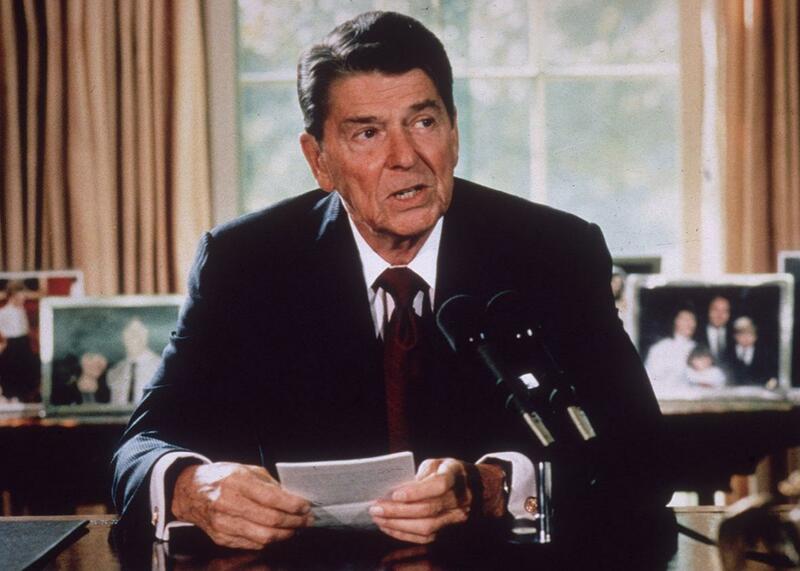 President Ronald Reagan makes an announcement from his desk at the White House in Washington circa 1985. I think the shortest, simplest explanation is that Republicans see Ronald Reagan as the last successful Republican president, one who inspired many of them and started them on an ideological trajectory that led them to today. I’ve not heard him compared with Abraham Lincoln much, but I’d imagine it’s because Lincoln is 1) arguably the best president in history, 2) unquestionably the best Republican president in history, and 3) the only good president everyday people know of who wasn’t from another party or tremendously at odds with their current ideology (i.e., scratch trustbusting, business regulating, consumer protecting, progressivism-founding, environmentalist Teddy Roosevelt). Who else would they idolize or idealize? Who else would they compare him with? Certainly not the two most recent Republican presidents (the George Bushes), the first who broke his tax promise and lost his re-election run or the second whose disastrous tenure is still fresh in everyone’s mind. Not the never-elected Gerald Ford, who served two and a half years before losing to Jimmy Carter. Not the man he replaced either, Richard Nixon, who resigned the office in utter disgrace. To find another Republican president, you’d have to go back almost all the way to the fifties and Dwight Eisenhower, who presided over high taxes, major infrastructure spending, and left with a warning about the military-industrial complex, not exactly winning messages with the current party. The Republican to hold the presidency before him was Herbert Hoover at the start of the Great Depression, another less-than-shining hour they need not highlight. Before Hoover there was Calvin Coolidge, whom practically no one knows anything about, and Warren G. Harding, whose two years in office were so corrupt and scandal-ridden that he’s been ranked last or near last in every poll of presidential scholars conducted since. So, while there are certainly positive reasons Reagan fans will provide, it still comes back to: If not Reagan, who else? There is simply no other Republican president in the past 100 years that they are truly proud of, so all effort goes into raising him up. There’s definitely more to it—he was the trailblazer of their anti-government ideology—but he also has little competition for their admiration. It’s not a point that gets made often, which is why I focused on it here. Abraham Lincoln: In terms of the modern parties was Abraham Lincoln a Democrat or a Republican? History of the United States: If JFK had lived, how would history be different? Ronald Reagan: Who would win Reagan 1980 vs Obama in 2008?